Still reeling from the death of one of their own, the Pathfinder heroes must chase a rogue Hellknight sorcerer to the foot of an ancient monument in the city of Korvosa. Inside lies a magical storehouse of treasures from a forgotten age, including the fabled Runescar Stylus capable of waking an army of petrified spellcasters. Yet the ancient Runelords didn't leave their treasures unguarded... Dungeon-delving excitement abounds in this wisecracking adventure from Pathfinder co-creator James L. Sutter (Pathfinder Hollow Mountain, The Redemption Engine), with art from Ediano Silva (Grimm Fairy Tales, Hellchild: The Unholy). Contains pull-out poster map and official Pathfinder RPG bonus encounter! Note: This product is part of the Pathfinder Comics Ongoing Deluxe Subscription. 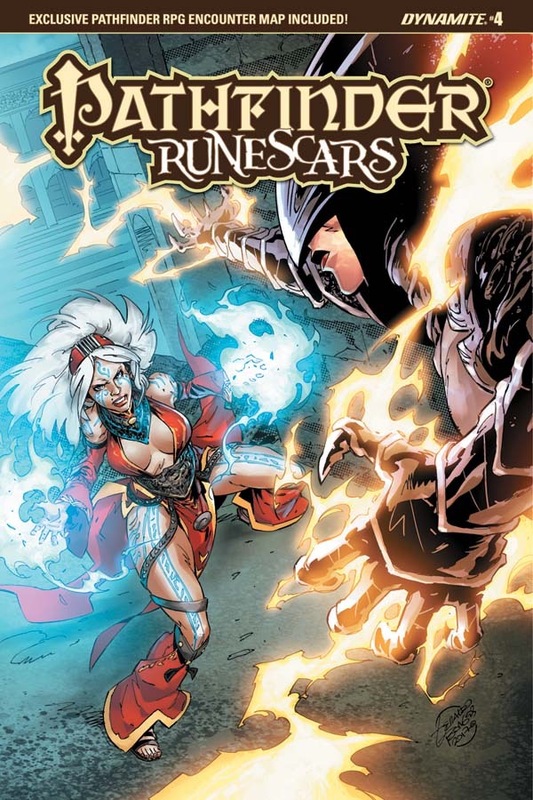 Sign in to start a discussion about Pathfinder—Runescars #4 (Standard Cover—Geraldo Borges)!